"This is a really old fashioned recipe that is really a Jewish eastern European dish. We serve this for holidays and on the Sabbath. It is really impressive looking and the taste is amazing. My family loves this. Once you get the hang of it it's really easy to make." Heat vegetable oil in a large skillet over medium-high heat. Stir in the mushrooms, and cook for 1 or 2 minutes until they begin to soften. Add the carrot, celery, and onion; cook and stir until the carrot begins to soften, 5 to 10 minutes. Turn the heat off, and stir in the garlic and parsley; set aside. Beat the eggs and water with salt and pepper in a large bowl. Fold in the bread cubes until they absorb the egg mixture, then fold in the cooked vegetables; set aside. Cut a deep pocket into the veal breast with a long, narrow knife. Stuff the veal with the bread and vegetable mixture, and season with paprika, onion powder, garlic powder, salt, and pepper. Place onto a roasting pan, and cover loosely with aluminum foil. Bake in preheated oven for 3 1/2 hours, then remove the foil, baste with pan drippings, and continue cooking 30 minutes more. When done, tent with aluminum foil, and allow the veal breast to rest for 15 minutes before slicing. Your new zesty family favorite chicken dinner! This is really a great recipe. There are not many recipes for this; but once you try it, you will love it. Very different. 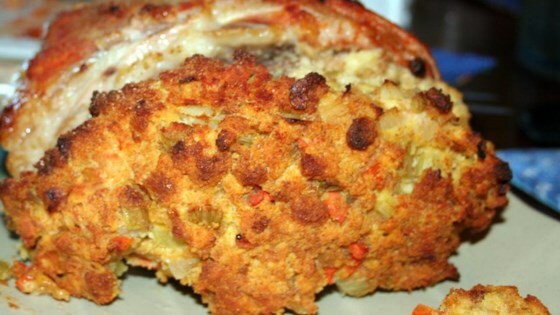 you do need a 5 lb veal breast for all the stuffing.